Is there reliable evidence regarding the method of murder in the Operation Reinhard camps of Treblinka, Belzec, and Sobibor? There is so much “hopeless confusion” in eyewitness testimony about the method of murder in the Operation Reinhard camps. The hopeless confusion proves that none of it can be believed. Treblinka, Belzec, and Sobibor were not death camps. Further, Holocaust denier Carlo Mattogno claims that because reports provided different accounts regarding the method of murder—most prominent among them electricity, steam, and sucking oxygen out of the room—the whole “story” of mass murder is unbelievable. During the war and immediately after, there were many theories about the method of murder at Treblinka, Belzec, and Sobibor. This was due to wartime rumor and hearsay. After the war, however, the testimony of both survivors and perpetrators is remarkably consistent on the method of murder: the Nazis and their collaborators used exhaust from gasoline engines to murder Jews in these death camps. An article in the New York Times on August 8, 1943. In the article, it was claimed that the method of murder was steam. The story was based on a report written by the Jewish resistance movement in the Warsaw ghetto, entitled “Liquidation of Jewish Warsaw.” This report also contained a detailed description of Treblinka. The resistance movement report made its way from the Polish government-in-exile in London, to the Black Book of Polish Jewry, and then to The New York Times. The diary of Eugenia Szajn-Lewin. Szajn-Lewin kept a diary in the Warsaw ghetto between July 1942 and April 1943. In her diary, she wrote that the method of murder was steam-heated air. She also wrote that when the victims were dead a floor flap dropped down and the bodies fell into a pit. The testimony of Samuel Rajzman, a survivor of Treblinka, in March 1945. Rajzman claimed that the victims were suffocated by sucking air out of the rooms. Razjman also mentioned “Cyclon-gas” [Zyklon-B] and other poisonous chemicals as possible methods of murders. The writings of Emanuel Ringelblum. Ringelblum was a historian in the Warsaw ghetto. He recorded that the method of killing was gas, steam, and electricity. Second-, third-, and fourth-hand accounts. In the case of The New York Times article, their information was third- and fourth-hand. 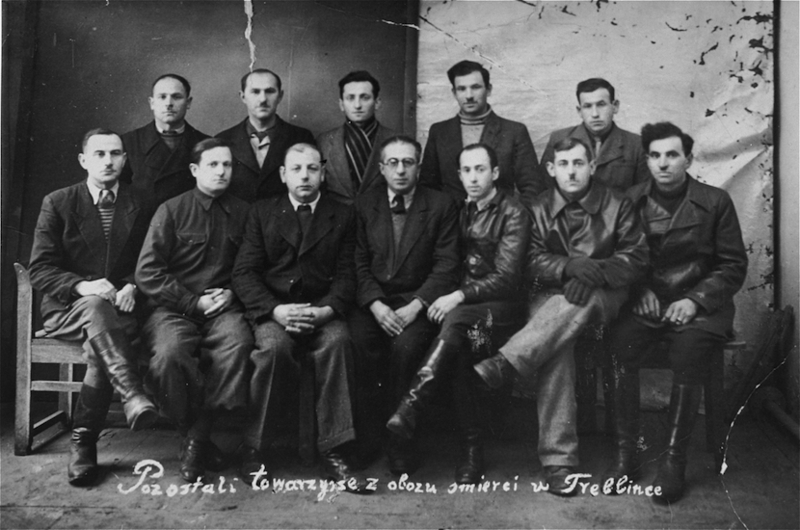 The sources in Poland (the Jewish resistance in the Warsaw ghetto, the Polish underground, and the Polish government-in-exile) were trying to get information about Treblinka out to the world. They included the best information they had at the time. However, their sources had to speculate about the method of murder since almost everyone who entered the extermination area of Treblinka did not survive to tell the real situation. Rumors. In the case of Szajn-Lewin and Ringelblum, they were merely repeating a rumor. A “rumor” is “a story or statement without confirmation as certainty as to facts.” Based on this definition of a rumor, their accounts do not rise to the level of evidence. Rather, both reports illustrate the level of fear and lack of knowledge the Jews of Warsaw had about their fate if they were “resettled.” Even Samuel Rajzman, a survivor of Treblinka, did not work in the extermination area. Rajzman claimed that he received his information from a camp doctor. The doctor also told Rajzman that this killing method was only a rumor he heard, not an eyewitness account. Likewise, uprisings occurred in Sobibor and Treblinka in August and October 1943, respectively, during which time there were a large number of escapees. Between their escape and the end of the war, those who made it to safety began to testify about what they had seen inside these camps and more detailed information began to emerge. In the decades after the war, some of the German perpetrators were arrested and tried. During their trials, more information came to light. Further, the sites were probed by Polish and Russians investigators after the war and their findings began to circulate as well. Thus, evidence emerged slowly and steadily over many years. This was especially true as more eyewitness came forward, as more high-profile trials took place, and as scientific studies of the sites began. In short, the confusion of war meant that sources of information about the method of murder in Treblinka, Belzec, and Sobibor were rumors or guesses. None of these accounts negate the more solid evidence we have today, based on eyewitnesses (both Jews and perpetrators), site investigations, and documents. Rather than taking fourth-hand newspaper accounts, rumors, and guesses as evidence, the eyewitnesses testimony of Jewish survivors and Nazi perpetrators is crucially important. What do eyewitnesses say about the the method of murder? The common element in most of the testimony is that an engine was used. Steam-heated air, sucking air out of the chamber, pumping in toxic exhaust gases, and even generating electricity, all of these require an engine, a generator, or some source of power. The common theme of an “engine” means that Mattogno’s claim about supposed contradictions is not such a mass of “hopeless confusion.” The speculation is rather consistent in following way: all of the reports and rumors confirm that systematic murder was taking place, and the Nazis and their collaborators where probably using efficient, machine-based methods. In fact, Rajzman’s conclusion that suffocation was the means of murder is not wholly wrong. It is reasonable to conclude that at least some of the victims died of suffocation, due to close quarters in the small gas chamber rooms. Mattogno’s so-called testimony “confusion” is easily attributable to wartime hearsay or educated guesses. The reports and the guesses actually had some common threads, as mentioned above. These sources do not rise to the level of primary evidence, but they must be understood contextually, which makes their errors entirely understandable. Likewise, we do have dependable eyewitness testimony that has emerged over time, from Nazi perpetrators, collaborators, bystanders, and Jewish survivors. This testimony comes from eyewitnesses who actually observed the process of murder at Treblinka, finally confirming that the method of murder was engine exhaust. Carlo Mattogno and Jürgen Graf, Treblinka: Extermination Camp or Transit Camp? (Theses & Dissertations Press, 2004), 67 at http://vho.org/dl/ENG/t.pdf. Carlo Mattogno and Jürgen Graf, Treblinka: Extermination Camp or Transit Camp? (Theses & Dissertations Press, 2004), 57 citing The Black Book of Polish Jewry citing “Treblinka. Official Report Submitted to the Polish Government” at http://vho.org/dl/ENG/t.pdf. See also the New York Times, August 8, 1943, 11. Carlo Mattogno and Jürgen Graf, Treblinka: Extermination Camp or Transit Camp? (Theses & Dissertations Press, 2004), 51 citing Eugenia Szajn-Lewin, Aufzeichnungen aus dem Warschauer Ghetto, July 1942 bis April 1943 (Reclam Verlag, Leipzig, 1994) at http://vho.org/dl/ENG/t.pdf. Carlo Mattogno and Jürgen Graf, Treblinka: Extermination Camp or Transit Camp? (Theses & Dissertations Press, 2004), 68 citing Razjman’s testimony given to the military prosecutor’s office of the 65th Soviet Army, First Lieutenant of Justice Jurowski (USSR-337), 9 of the German version at http://vho.org/dl/ENG/t.pdf. Carlo Mattogno and Jürgen Graf, Treblinka: Extermination Camp or Transit Camp? (Theses & Dissertations Press, 2004), citing Emmanuel Ringelbum, Kronika getta warszawskiego, ed. by Arthur Eisenbach (Cztelnik, Warsaw, 1983), 416 at http://vho.org/dl/ENG/t.pdf. In English, see Emmanuel Ringelbum, Notes from the Warsaw Ghetto (ibooks, 2006), 321. Jonathan Harrison, Robert Muehlenkamp, Jason Myers, Sergey Romanov and Nicholas Terry, Belzec, Sobibor, Treblinka: Holocaust Denial and Operation Reinhard. A Critique of the Falsehoods of Mattogno, Graf and Kues, 47, 48 at http://holocaustcontroversies.blogspot.com/2011/12/belzec-sobibor-treblinka-holocaust.html. Select Google Docs, Rapidshare, or Archive.org for PDF version. They are citing Zygmunt Marikowksi, Zwiazek Walki Zbrojnej, I, Armia Krajowa w Okregu Lubelskim, London. 1973. Book Two, Documents, 34, 35, also translated and cited in Yitzhak Arad, Belzec, Sobibor, Treblinka: The Operation Reinhard Death Camps (Indiana University Press, 1987), 350, 351. For a thorough discussion of what we knew about the Operation Reinhard camps and when please see Jonathan Harrison, Robert Muehlenkamp, Jason Myers, Sergey Romanov and Nicholas Terry, Belzec, Sobibor, Treblinka: Holocaust Denial and Operation Reinhard. A Critique of the Falsehoods of Mattogno, Graf and Kues, 43-69 at http://holocaustcontroversies.blogspot.com/2011/12/belzec-sobibor-treblinka-holocaust.html. Select Google Docs, Rapidshare, or Archive.org for PDF version. Yitzhak Arad, Belzec, Sobibor, Treblinka: The Operation Reinhard Death Camps (Indiana University Press, 1987), 104. See also http://www.nizkor.org/ftp.cgi/people/p/pfannenstiel.wilhelm/pfannen.001 for Pfannenstiel’s affidavit. Jonathan Harrison, Robert Muehlenkamp, Jason Myers, Sergey Romanov and Nicholas Terry, Belzec, Sobibor, Treblinka: Holocaust Denial and Operation Reinhard. A Critique of the Falsehoods of Mattogno, Graf and Kues, 294 citing Franz Hödl, 29.03.1966, StA Dortmund, Verfahren gegen Gomerski at http://holocaustcontroversies.blogspot.com/2011/12/belzec-sobibor-treblinka-holocaust.html. Select Google Docs, Rapidshare, or Archive.org for PDF version. Yitzhak Arad, Belzec, Sobibor, Treblinka: The Operation Reinhard Death Camps (Indiana University Press, 1987), 70-71 citing Belzec-Oberhauser, Band 8, 1843-1484. “The Interrogation of Pavel Vladimirovich Leleko,” The Soviet Protocols, February 20, 1945 at http://www.nizkor.org/hweb/people/l/leleko-pavel-v/leleko-001.html. Yankiel Wiernik, “A Year in Treblinka” (“Chapter 7”) at http://www.zchor.org/treblink/wiernik.htm.